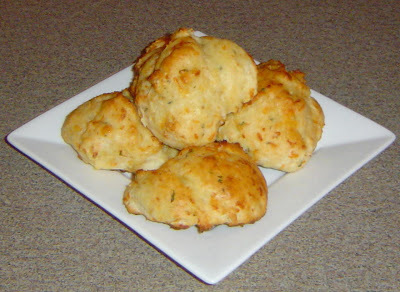 Kitten with a Whisk: Easy Cheesy Biscuits! These are so so SO yummy. They are suspiciously close to the Cheddar Bay Biscuits you can get at Red Lobster. I came across this recipe years ago in a Taste of Home magazine that my great aunt had. I’ve been making them ever since and they always go fast. And you really can’t find an easier biscuit recipe. The original recipe can be found here at Taste of Home’s website. I’ve added a few variations so mine is below. • This recipe yields two dozen but can easily cut in half. 1- Preheat your oven to 375. Mix Bisquick, broth, cheese, and parsley in a large bowl until dough forms. 2- Drop large tablespoons of dough onto a baking sheet. Bake for 10 minutes or until toothpick comes out clean. 3- While biscuits are baking, melt your butter. Brush butter over biscuits when they are done and still hot. Its.That.Easy. If I had one of those Staple’s “That was Easy” buttons, I would have just pushed it. Thoughts: The two additions I added (parsley and butter) were really just to enhance the biscuits a tad more. I liked how the parsley adds a little fleck of color, and the melted butter gives them a more golden color and adds a bit more of a richer flavor. They go great with any dinner and especially great with chili. A bit of a warning though: Don’t be tempted to add more cheese. I tried that once and it didn’t work out well. Save them in an airtight container and they will keep for a couple of days.